Agaricus flavidus Fries, Syst. Myc. 1: 250. 1821. Flammula flavida (Fr.) Quélet, Champ. Jura & Vosges 130. 1872. Dryophila flavida (Fr.) Quélet, Enchir. Fung. p. 71. 1886. Illustrations: Text figs. 182-183; pl. 34. Pileus 3-7 cm broad, convex, expanding to broadly convex or nearly plane, margin incurved at first, surface thinly viscid and glabrous except for faint veil remnants variously arranged along the margin, yellow to watery dingy ochraceous-tawny, near "warm-buff" or brighter where faded, often with a watery zone along the margin. Context rather thick and firm, yellowish; odor faintly fragrant, taste mild. Lamellae adnate to adnexed, close, narrow to moderately broad, pallid when young, pale rusty brown to "Sudan brown" in age, thin, edges even, no color change when bruised. Stipe (4) 6-10 (12) cm long, 5-15 mm thick, equal or narrowed below, solid, pallid and silky above, with a faint evanescent zone of fibrils from the thin veil, lower part fibrillose-striate, becoming dark rust brown from base upward. Veil yellowish. Spores 7-9 x 4-5 µ, smooth, apical pore distinct and apex in many appearing slightly truncate; shape ovate to subelliptic in face view, in profile somewhat inequilateral, with a slight apiculus and a faint suprahilar depression in some; color in KOH dull tawny fading to ochraceous on standing, in Melzer's reagent soon decidedly darker and redder (somewhat dextrinoid). Basidia 4-spored, 24-32 x 5-7 µ, utriform (mostly slightly ventricose in midportion), yellowish in KOH and also in Melzer's reagent. Pleurocystidia none, cheilocystidia versiform, 26-40 x 3-9 µ, subclavate, subfusoid to near cylindric but outline mostly irregular, thin-walled, smooth. content homogeneous. Caulocystidia similar to cheilocystidia or longer and more versiform: 1) clavate and 15 x 9 µ (these rare); 2) elongate-subclavate 30-55 x 5-8 µ, outline irregular; 3) a few utriform-elongate, 34-47 x 7-10 µ walls thickened to about 1 µ and bright rusty brown, with or without encrusting material. Gill trama of subparallel hyphae with thin, smooth, yellowish walls (in KOH) the cells elongate inflated 4-6 µ wide becoming up to 15 µ; subhymenium a very narrow non-gelatinous cellular zone (about 2 cells deep). Pileus cutis a thick gelatinous layer of hyphae 2.5-6 µ diam., dispersed loosely in the matrix, the hyphae ochraceous to hyaline and smooth to slightly incrusted; hypodermial zone not very distinct but slightly more colored than the context, hyphae smooth, 4-12 µ diam. Context hyphae with smooth, thin, pale greenish yellow walls in KOH, hyphal cells inflated, some orange-rufous oleiferous hyphae present. Clamp connections present. All hyphae inamyloid. Habit, Habitat, and Distribution: Caespitose on logs and at the base of trees and stumps of conifers and hardwood, Maine, Idaho and Oregon, August-November. 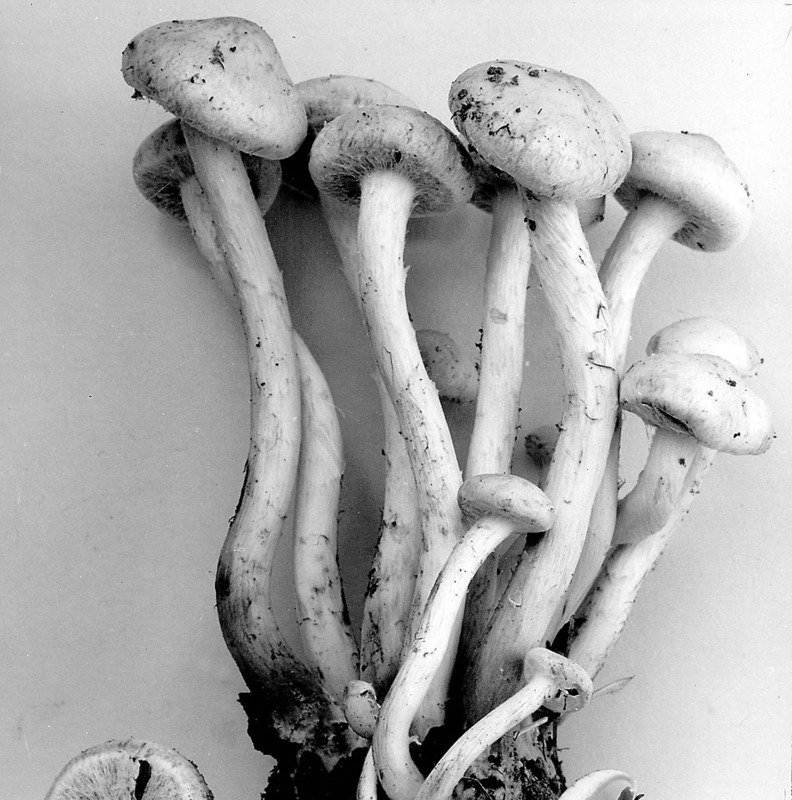 Observations: The fragrant odor, pallid gills when young, small spores, and utriform basidia appear to distinguish it. In some caps the hypodermium is rusty orange but fades on standing. Odorless collections of this variety appear to be identical with a collection of Flammula flavida sensu Konrad & Maublanc from Josserand, Lyons, France. Fries described this species as having gills at first whitish, which fits our material. This is our common species on conifers in the Rocky Mountain area. It will probably always be a rather hopeless problem to deal with the confusing literature on the "P. alnicola" problem on the one hand and the variation of the fungus in nature on the other. We have simply based our concept on excellent specimens from Europe which check with ours in all respects including the well developed gelatinous epicutis of the pileus which consists of a tangled mass of narrow yellowish to hyaline hyphae. Moser (1955) gives the spores as 6-7 x 4-4.5 µ; obviously this is not the same as Josserand's material. The odor in our specimens varies from none to faintly fragrant. Spores 7-9 x 4-5 µ smooth, apical pore present but minute, shape in face view ovate to elliptic, in profile somewhat inequilateral, color in KOH ochraceous-tawny to duller pale tawny, in Melzer's reagent rusty brown (dextrinoid); wall around 0.3 µ thick. Basidia 4-spored, 22-26 x 6.5-8 µ, clavate, yellowish to hyaline in KOH, not changing appreciably in Melzer's reagent. Pleurocystidia none. Cheilocystidia mostly clavate, 26-34 x 7-10 µ, hyaline, smooth, content homogeneous. Caulocystidia 33-60 x 6-9 µ, cylindric to narrowly clavate, hyaline in KOH, thin-walled, content "empty". Gill trama subparallel, of floccose-interwoven thin-walled hyphae; walls yellowish in KOH, smooth, content often orange-brown in Melzer's reagent. Subhymenium not a sharply defined layer, hyphae compactly interwoven, non-gelatinous (in sections the layer appearing more or less cellular). Pileus cutis a gelatinous pellicle of mostly ochraceous narrow (2-3 µ) gelatinous hyphae smooth to incrusted, hypodermial region of ochraceous, incrusted floccose hyphae 4-10 µ diam. Context hyphae interwoven, filled with "colloidal" content, becoming rusty reddish in Melzer's reagent. Clamp connections present.